He might not know exactly how many points he has or where he ranks on the all-time scoring list, but when it comes to the numbers game, Mark Recchi is right on the mark. At 42, he is the oldest active player in the NHL, a veteran who continues to excel players half his age. He ranks ninth on the all-time games played list with 1,606. He is 20th all-time with 570 goals, 14th all-time with 936 assists and 13th all-time with 1,506 points. But when it comes to knowing where he stands against some of the greatest players to have ever skated in the NHL, Recchi admits he's not quite up to speed on his statistics. Perhaps Recchi's greatest thrill when it comes to his ever increasing list of milestones is seeing how others react. “Teammates have been awesome with that and really made it enjoyable. His NHL career has been impressive almost from the moment he joined the big-league ranks in 1988-89. Recchi, who played his junior hockey for the Kamloops Blazers of the Western Hockey League, had his number 8 retired by the team shortly after he left for the NHL. He was drafted by the Pittsburgh Penguins, first playing in the NHL 1988, and was a key contributor in their Stanley Cup championship in 1991. 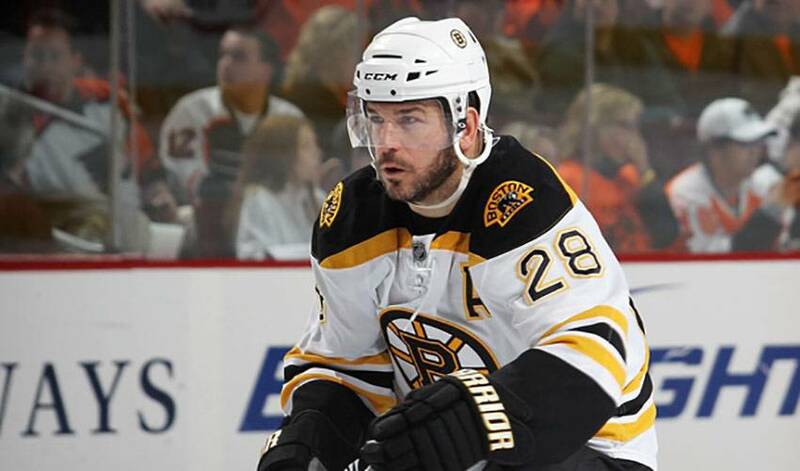 Now, in his 22nd season, Recchi, a two-time Cup winner (also with Carolina in 2005), might have slowed down a step, but his leadership, work ethic and ability to come up big in the games that matter most, make him a coveted member of a Boston team eager to raise another Stanley Cup banner. So, just how does it feel to be known as the oldest player in the league? “I don't know if it's good or bad, but it's all how you feel,” said the seven-time All-Star selection. “I still feel good, and every year you go into it when you're at the end of the season, see if I can do the training, and I've been feeling good, and health-wise, knock on wood, it's been really good. Then you just make that decision from there. As to whether or not he'll be back in 2011-12, Recchi isn't in a rush to make any decisions. “At the end of the season I'll see,” said Recchi, who was a finalist for the NHLPA's Ted Lindsay Award in 2000 (then known as the Lester B. Pearson Award). “I'll see how I feel and see how the rest of the year goes and how the playoffs go and see if I can make that commitment again in the summer to train and do what I need to do to get ready for a season. For now, Recchi's committed to seeing the Bruins take a serious Cup run, something he knows won't be easy, but a challenge he's eager to undertake. Winning the Northeast Division would be a good launching pad, according to Recchi. Having one of hockey's enduring stars still making a significant impact, Mark Recchi's teammates will tell you, is just as important.